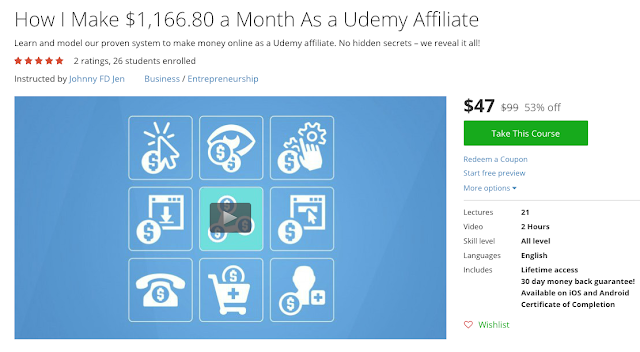 Hey everyone really excited to announce new course on making money online as an affiliate for Udemy. 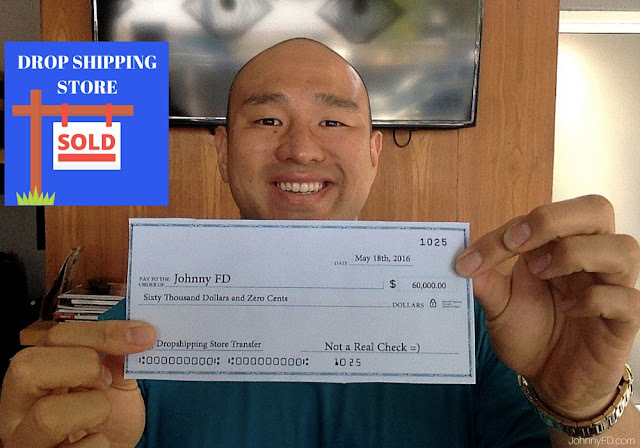 This started as just a case study for my main membership course, Earnest Affiliate as I wanted to show my members how they could take a brand new product and start promoting it from scratch and make over $1,000 a month from it, which is exactly what I ended up doing. In this blog post I'm going to explain what my new course is all about, as well as what the difference is between my courses Udemy Affiliate and Earnest Affiliate. I'll also talk about which one may be right for you. Udemy Affiliate is my new training course that teaches you how to earn money by promoting courses on Udemy as an affiliate. I first got the idea because as a teacher on Udemy, I noticed that 75% of my paycheck was often going to Udemy and Udemy Affiliates while I only kept 25% of the course sales for myself. I knew these guys were making a ton of cash promoting the course that I made. 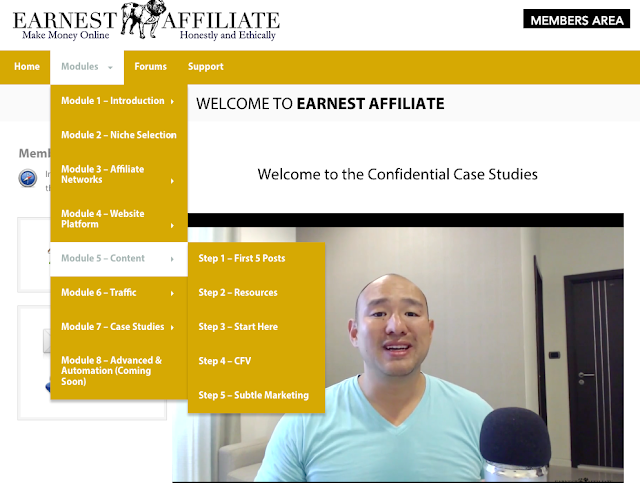 When I first decided to create the Udemy Affiliate course, it was going to be just a cheap way for people to get a preview of what I already teach inside my full blown membership site, Earnest Affiliate. But as soon as I started outlining the course and later filming, I realized that it's actually exactly what a lot of people have been looking for and is a complete course on it's own. 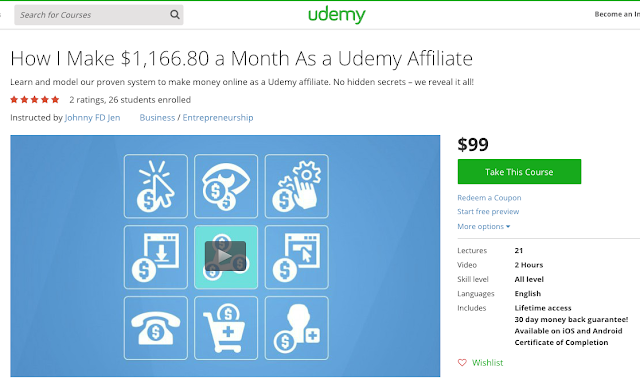 Check out a free preview of Udemy Affiliate here. If you're already a member of Earnest Affiliate, don't worry you're already getting the good stuff and can completely ignore this blog post. In fact, as an EA member, you get lifetime updates to the course for free so if you log into the member's area, you'll see a new module added, and if you check your email inbox, you'll also see that you now have access to my new Udemy Affiliate course completely for free. For everyone else, the reason why my original course, Earnest Affiliate is better is because it's complete and nothing is held back. I show all of my affiliate income sources and currently have 5 case studies where I show my various forms of affiliate income. Also inside Earnest Affiliate I go into a lot more detail and show you step by step, basically holding your hand through the entire process. Inside the new Udemy course, I only cover the Udemy aspect of affiliate marketing and don't go into detail on things like building your email list, different affiliate networks, promoting physical products, etc. 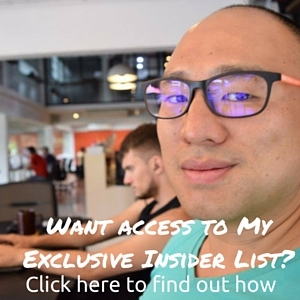 You also don't get access to the private member forums inside Earnest Affiliate where people openly share their niches, websites, monthly profits and progress. 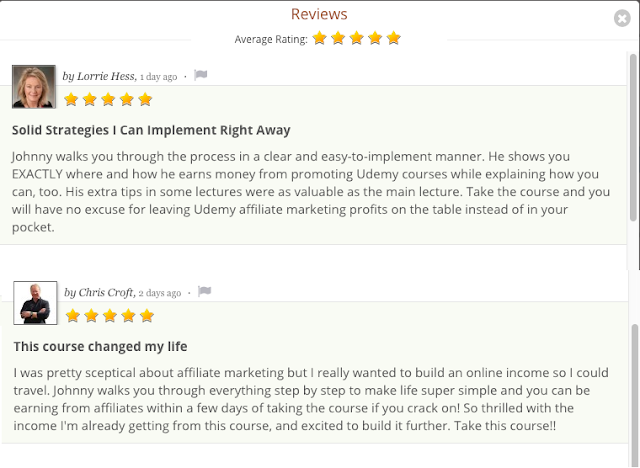 You might be asking, "If Earnest Affiliate is the more complete better course, why the heck join the Udemy course?" 1. Udemy Affiliate is a quicker, faster, leaner, version that will get you through all of the videos in just a few days instead of a few weeks. This is good for people who already know how to build a website, and just want an overview of what to do and the steps to get them there. 2. The Udemy course is a lot cheaper, Earnest Affiliate's price will eventually go up to $499 once I finish adding all of the videos but the Udemy course will always sell for less than $100. This is good for people who aren't fully committed to joining EA yet but still want to get started. 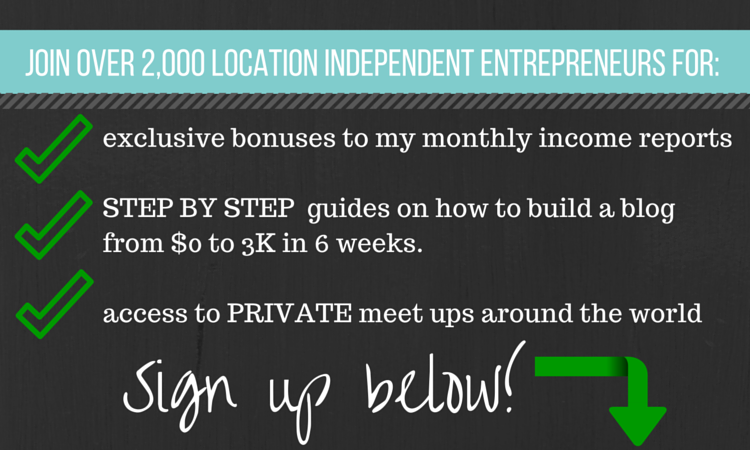 Whichever option you choose you'll be one step closer to creating your own location independent source of affiliate income and you'll get to learn exactly how I've done it. Reviews of my new course from real students! As a special offer readers of my blog can get my new course for 50% off by clicking here which is only $47 and includes an all access pass inside my Udemy Case Study where I show you how I've made $1,116.80 my very first month as an affiliate on Udemy and how you can replicate my success. I show you exactly which products I promote and how much money I've made from each course as well as where that traffic came from. Best of all, it was all done with zero ad budget. Inside the course I show you how to leverage the reputation and audience of the course creator to get you sales even if you don't yet have an audience of your own. Do yourself a favor and join the new Udemy Course, it could very well be the start of an entire new stream of location independent online income as it has for me. I hope to see all of you inside the course. Feel free to share this post with anyone who might be interested. My goal is still to eventually get everyone to join my main membership site as it's where I can help you the most, but I genuinely think that my new Udemy Course is a great first step there. Best of luck with all of your online businesses and in creating multiple streams of semi-passive income like I have. Johnny successfully highlights the value of building a long term strategy for Udemy promotion by building an authentic an unique offer using blogging to build an audience. This course will highlight those methods you can use to gain followers to your offer. Though not suited for direct linking or (fast buck strategies) this course is a great intro for those looking to learn which mediums best fit your style of content and how to capitalize on the work that you put into creating and building trust. Hey Clinton, really glad you like the course and took the time to write a review of it!